'CloseUp Forever Summer' 2016 tragedy: deaths due to “party drugs”? MANILA, Philippines – Almost a year in the making, the Closeup 'Forever Summer' 2016 event and concert has been marked as a total fiasco where five attendees died due to alleged “party drugs” intake on May 21 at the SM Mall of Asia Concert Grounds in Pasay City. The said event of the popular toothpaste brand has been an annual tradition for the yuppies. Teen stars and love teams like James Reid and Nadine Lustre and other local leading bands suit up to entertain the crowd. It was even branded as a music festival by the top bloggers and influencers in the country. But in this year's 'Forever Summer' event, it looks like the organizers and the brand management itself have lots of explaining to do to the authorities due to five confirmed teen deaths on the said party. Pasay police is now conducting a thorough investigation. A handful of information with regards to the cause of death of the victims have now been circulating on all social media platforms. 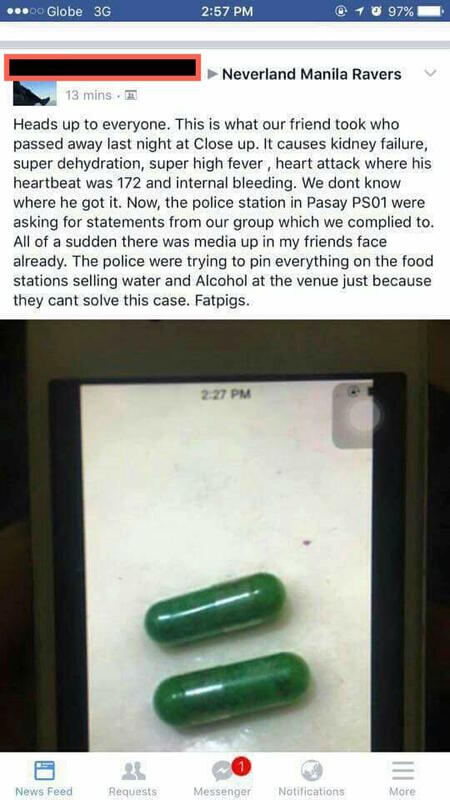 The netizens have been pointing to a particular party drug that led to the victims’ untimely demise. Looks like an ordinary dietary supplement. But beware, these capsules can kill you in an instant. The authorities have spoken with the friends of the victims. According to the testimonies of the witnesses, the killer party drug has been mixed with alcoholic drinks and passed on to different party goers. Sudden BP shoot-up, very high fever and palpitation manifested on the fallen hipsters. The victims identified were Ariel Leal, 22; Lance Garcia, 36; Bianca Fontejon, 18; and American national Eric Anthony Miller, 33, all collapsed and unconscious in separate areas of concert venue. Reports said that Fontejon and Miller were brought to the Manila Doctors’ Hospital around 2 a.m. (May 22) while Leal and Garcia were rushed to the San Juan de Dios Memorial Hospital at 3:37 a.m.
Ken Labugin, 18, who was also found unconscious and was earlier reported in critical condition at the San Juan de Dios Hospital, also died Sunday night. Actress Alma Concepcion posted on her Facebook account that she was present at the concert. She noticed that there’s a group of teenagers who were dancing non-stop and obviously onto something different. She then saw one girl whose arms got stiffed and fell unconsciously on the ground. From then, she knew that there’s something wrong going on. The police are also tracing down all the concessionaires who participated in the said event to get more statements and even evidences. The witnesses are all blank on where the victims got the illegal drugs from. Cops are also clueless if the concert was infiltrated by a drug syndicate targeting party people and students. As of publishing, incoming president Rody Duterte hasn’t released any comments on the considered-tragedy. But it is expected to give one. Duterte being known as an anti-illegal-drugs advocate will surely make his move and hunt down the culprits. Closeup has also released a statement on their Facebook fan page apologizing to the public that despite of the strict security measures that they have implemented, there were still some casualties occurred that caused five young lives. The brand has also extended their symphaties and condolences to the bereaved family of the victims. Closeup’s official statement on the 'Forever Summer' 2016 event debacle.